A demo for Aeterno Blade recently hit the eShop, with a price yet to be declared as it's still apparently in its early stages. It's being developed by Corecell Technology and published by Arc System Works. It's billed as a 3D Action Platformer and resembles the older Castlevania titles, before huge, sprawling maps were introduced. This is more of an arcade experience, with distinct stages with a performance ranking at the end of each. 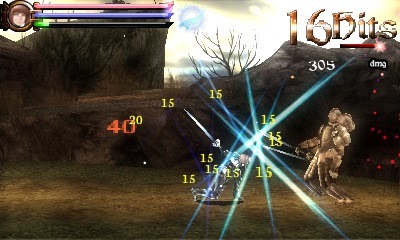 For an eShop title, Aeterno Blade is visually very impressive. Character models are well detailed, and we're treated with a nice-looking cinematic at the start. Nothing incredible, but more than one might expect from a largely unknown company. Unfortunately, in its current state, it looks a lot better than it plays. It seems Corecell are putting presentation ahead of gameplay with Aeterno Blade. It just feels unpolished, and a little sluggish. Freyja, our protagonist, is armed with a number of different flashy attack sequences that can be thrown out in rapid succession, while enemies seem to attack once per second, at most. This turns it into a mindless button masher with pretty visuals, but little sense of reward. These skills, as well as four basic stats, can be strengthened as Freyja levels up. She can also equip various trinkets that increase hit points and mana, among other things. It's all pretty standard. Aeterno Blade has a time-rewind mechanic that, while not completely original, is used in clever ways. 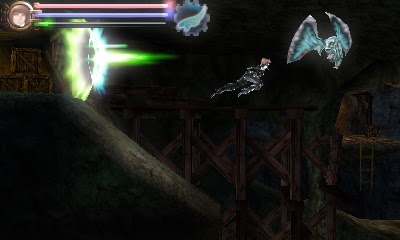 Upon death, the player can rewind the clock on Freyja's blade to reverse the events leading to her death, essentially acting as an extra life. This mechanic uses a significant amount of mana, which recharges slowly over time. Later in the stage we gain the ability to reverse time at the push of a button while being able to move freely, but objects that blink green are unaffected. This is used to access a previously out of reach area by reversing one moving platform in order to make it cross paths with a timeless one. Seeing how this is used in later levels is almost more compelling a reason to play the game than the combat itself. Braid crossed with Castlevania is a game I can get behind, so I won't write it off just yet. In its current state, it would be well worth a few bucks but given the level of production it'll probably be around the ten dollar mark. Hopefully the folks are Corecell can turn this into a game worthy of that price tag.